It had to happen. In the latest of a long line of “wake-up” calls, there is confirmation of resistance to four herbicide modes of action in a ‘Top 100 World’s Worst crop weeds’ population. The scary thing is that three of these modes of action are our major knockdown herbicides glyphosate, paraquat and glufosinate. The fourth is Group A. The rese arch confirming 4 modes of action in the one population of crowsfoot grass (Eleusine indica) from Malaysia has just been published in a paper by Jalaludin, Yu and Powles (Team AHRI) in the journal Weed Research. Crowsfoot grass is a C4 tropical-sub tropical grass that behaves as either an annual or perennial and can produce up to 50,000 seeds per plant. It is a rampant weed of pastures, annual crops, horticulture/plantations and non-crop areas, such as roadsides. This species is also in the top 200 worst environmental weeds in south east Queensland. In 2012 David Thornby et al rated crowsfoot grass the 16th most likely weed to develop glyphosate resistance in Australia. 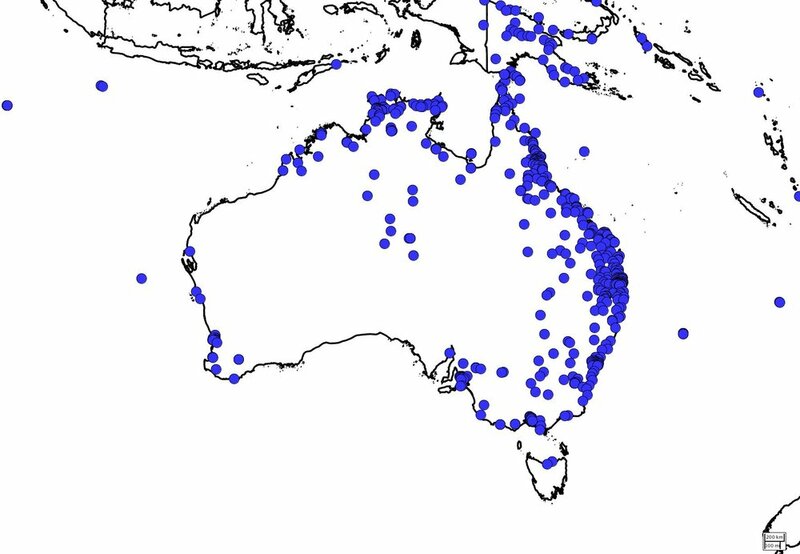 The map below however shows that complacency should not be entertained as this species is widely distributed across Australia, and is particularly vigorous above 30 degrees lattitude. Crowsfoot grass has a trail of herbicide resistant populations across 8 countries to 7 different modes of action. It was the second species in the world to develop resistance to glyphosate. Table 1 below shows the year the mode of action was first confirmed by country. Table 1. First case of herbicide resistance confirmed in crowsfoot grass to different modes of action. To date no populations of crowsfoot grass in Australia have been confirmed resistant to any herbicide mode of action. Malaysia is obviously a hot-spot of resistance with this species so what is it about this country that makes it this way? Large populations of rapidly growing weeds. There is a large area of ‘plantation’ agriculture, with 5 million hectares planted to oil palms (2011) alone. This creates large areas where weeds can grow with little competition from the crop. Oil palm (Elaeis guineensis) bunch that can weigh up to 15 kg. What will be the next action to manage this weed in Malaysia? There are two modes of action remaining - amitrole from Group O and 2,2-DPA and flupropanate from Group J. None of these have the effectiveness or flexibility of the herbicides already lost. Non hebicide options will also be less effective and difficult to implement. Remember that in late 2013 annual ryegrass from a vineyard in Western Australia was confirmed as being resistant to both glyphosate and paraquat? This occurred due to the sequential use of both herbicides over a decade or more, with no action preventing surviving plants from setting viable seed. How do we avoid going down this 'one-way elevator'? As outlined in the GRDC Integrated weed management manual controlling the survivors of any herbicide application is the key stone of resistance management. Simply going from one herbicide mode of action to the next produces weeds with resistance to multiple modes of action. Imagine losing the effectiveness of glyphosate and paraquat in your major weed species! This is the same message in different words and continues to be relevant today. For further information on the multiple resistance research go here.